For his sci-fi alien invasion flick, The Darkest Hour, director Chris Gorak turned to composer Tyler Bates to compose a modern, electronic score to accompany his image of electric aliens attacking Earth. The resulting score actually almost sounds like random electric pulses and white noise. Bates is a composer whose work I've never been able to warm to. After the egregious plagiarism scandal over his score to Zack Snyder's 300, Bates has composed a series of mostly forgettable collections of aural noise and electronic droning that as a standalone listening experience is pretty hard on the ears. The first track, "Space," pretty much sets the tone with some low register rumbling and dissonant electronic pulses. The second cue, "Northern Lights," is where things really start to go awry. It actually sounds as if we're just listening to the electronic screeches of an overloaded switchboard. I understand the context, with the aliens being made up of nothing more than electronic energy, but it's nearly impossible to listen to on CD. "Night Club Attack" is actually a pretty decent action cue, but there's little to distinguish it from the pulsing rhythms of the typical Hans Zimmer-esque wall of sound that is so common in action films today. A great deal of the score is anonymous droning and standard low level suspense writing, with the occasional electronic blast that sounds more like fingernails on a chalk board than music. With very little to break up the monotony, The Darkest Hour is a painful experience on album. There's very little suspense or atmosphere, just noise, often sounding more like ambient sound design than music. That atmposphereic electronic technique has been employed much more artfully and to greater effect in scores like Drive and The Girl with the Dragon Tattoo. Bates actually brings in a piano in the cue, "Say Goodbye," which comes as a welcome shock when surrounded by such noise. It's too little, too late however as the score transitions right back into the screeching in "Man Overboard," and doesn't let up, especially in the completely unbearable "Fighting Back." The final track, "Looking Forward," is an attempt at Trevor Rabin-style heroism, but it's so overwhelmed by the ear-piercing electronics that it doesn't really have any effect other than signalling to the audience that the torture has ended. I have to hand it to Bates that the use of electronic elements actually makes thematic sense here, but it just doesn't work as music. Or anything else, for that matter. The Darkest Hour has no real personality or distinguishing traits. Which is my main problem with Bates' work so far. He's clearly in demand, but he has yet to assert his own artistic voice. Here's hoping the new year will bring him the opportunity to work with a director who will force him to stretch his legs out of his comfort zone, rather than allowing him to fall back on tired crutches. Now available for digital download, CD available January 17. Thomas Newman has long been one of my favorite composers, so it is a bit surprising that he has composed 4 major scores this year that ultimately have left very little impact on me - The Adjustment Bureau, The Debt, The Help, and The Iron Lady. Good films, all, but their scores just didn't really stick with me the way Newman's work usually does. 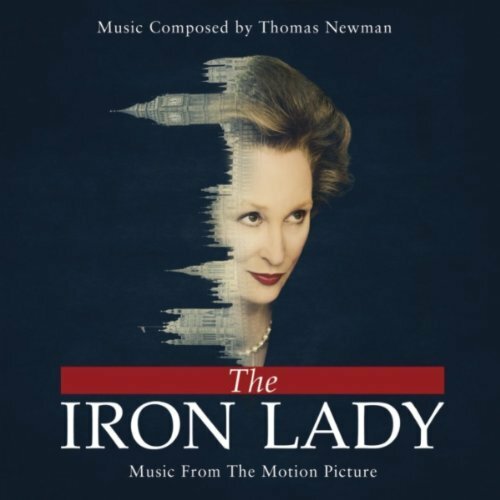 My favorite of the four, however, is The Iron Lady, both as a score and as a film, which I find to be greatly misunderstood and unappreciated. What is universally recognized, however, is that Meryl Streep gives a tremendous performance as Britain's only female Prime Minister, Margaret Thatcher. With such a strong central performance at its core, one would think that Newman would create a strong thematic identity for such a powerful personality. 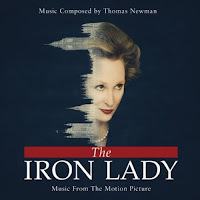 Alas, there is nothing like that to be found in The Iron Lady, which seemingly takes its cues from Alexandre Desplat's The Queen in how to score biopics without commenting on them too much. Newman's music is often cool and subdued, enhancing the film but almost as an impartial observer rather than an invested commentator. The album kicks off with the traditional march, "Soldiers of the Queen," accompanied by faint cheers and applause, evoking the flashback structure of the film, as Thatcher's memories slowly return to her in her old age. After some of his trademark eccentric rhythms (mixed with Desplat's dancing flutes) in "MT" and "Grocer's Daughter," Newman hits us with some atonal dissonance in "Grand Hotel," to accompany the IRA bombing that nearly killed Thatcher and her husband Denis. It isn't until track 4, "Swing Parliament," that Newman creates any kind of thematic identity for Thatcher. It's a noble yet subdued piece for gradually rising strings and horns that never really appears again until the score's climactic track, "Steady the Buffs." As a whole, Newman chooses to score the film as a series of individual moments rather than as a thematic whole. The dancing woodwinds motif returns in ""Fiscal Responsibility," and a grand British military march comes into play with Thatcher's victory in "Discord and Harmony." There's even a bit of action music in the rhythmic "Exclusion Zone" heralding the beginning of the Falklands War. The score itself concludes with "Steady the Buffs," which goes from a frenetic string passage to an elegiac reprise of the noble Thatcher theme as the ghost of her beloved Denis finally fades into the distance. It's a lovely theme, and a reasonably entertaining score, but one would almost expect something of more dramatic weight for its subject. It remains a strangely light score, entertaining in moments but lacking a strong personality of its own. While one could argue the strong personality is Thatcher herself, and in turn Streep's performance, but a woman like Thatcher deserves something stronger. Lovely and unassuming on its own, the music just isn't strong enough to assert itself into any kind of cohesive listening experience. I've never been a big fan of these cash-in rerecordings of popular scores. 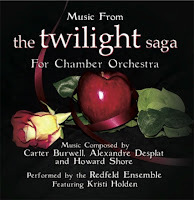 Music from The Twilight Saga for Chamber Orchestra is, on paper, clearly an attempt to wring a few extra dollars out of Twilight fangirls eager for anything Twilight related. The actual product, on the other hand, is a completely different matter. No one was more surprised than I was to have fallen so completely in love with this collection., which rearranges the scores for the first three Twilight films for chamber orchestra performed by the Redfeld Ensemble. I've always been a fan of the music from the Twilight saga, despite my distaste for the series itself. All three of its composers, Carter Burwell, Alexandre Desplat, and Howard Shore have brought something different to the table. Burwell's score to the original Twilight remains the weakest of the series, with the well known "Bella's Lullaby" marking the only interesting thematic idea of the film. The rest is mostly a dull mire of Burwell's more modern sounding ideas, which while perhaps appropriate for a story so popular with young people, the fully orchestral scores for later films would far outshine it. Burwell bounced back with his grand score for Breaking Dawn: Part 1, which does not make an appearance here. When placed side by side with the work of Desplat and Shore on the album, it seems all the weaker, and the other cues like "Phasination Phase," "I Dreamt of Edward," and "The Lion Fell in Love with the Lamb" offer little if any kind of distinct personality even here. Desplat's New Moon remains the high mark in the series, as Desplat composed one of the most lush and romantic efforts of his career. The sweeping main theme, as well as the lovely secondary theme for Jacob Black and his love for Bella are some of the most gorgeous and haunting compositions Desplat has ever composed, and it seems a shame that they were wasted on such a terrible film. His score is most perfectly suited to the chamber orchestra, and the tracks "The Meadow" and "New Moon" soar in their new arrangements, with "The Meadow," which was originally a solo piano piece, getting some gorgeous string work laid in to accentuate its beauty. The track "You're Alive," gets the added bonus of some solo female vocals which were not present in the original score, and add a surprisingly poignant atmosphere to the score's weighty sense of romantic longing, and the haunting theme for Jacob gets a full work out in "Marry Me, Bella," this time accompanied by vocals, which only add to its tragic nature. The main theme gets one more large work out in "Full Moon," mostly a reprise of "New Moon," but with the added vocals present, setting it more apart than on the original album. For Eclipse, Howard Shore tried to marry Burwell's more modern approach with the classical one employed by Desplat in New Moon, with mixed results. Shore's work on Eclipse isn't quite on par with New Moon, but it does feature a beautiful new theme for Jacob Black (a bland character who seems to inspire great music), which receives a full piano driven performance in "Jacob's Theme (Instrumental)," with the orchestra's strings giving it a new personality. There are only three tracks of Shore's score on this album, and with good reason - it doesn't really lend itself to the chamber orchestra format the way Desplat's score does, which makes up the bulk of the running time. The album concludes with the odd track, "How Bella Got Her Groove Back," a bizarre, funky remix of "Bella's Lullaby" that doesn't fit with the the rest of the album. It sounds like some sort of strange island dance by way of elevator music. It doesn't take away from the experience of the album as a whole, however, which may scale back the large scale nature of the scores to a small ensemble, but it's undeniably gorgeous. It may look like a cheap knock-off, but for fans of these scores, this album gives them a startling new life.